Drought in the Four Corners is placing further stress on farmers bringing their local produce to market. Seeking an opportunity to collaborate, some growers are placing a collective risk in a cooperative working to expand the reach of their products. KSJD’s Daniel Rayzel stopped by a warehouse in downtown Cortez to learn how the co-op helped farms through a difficult year. 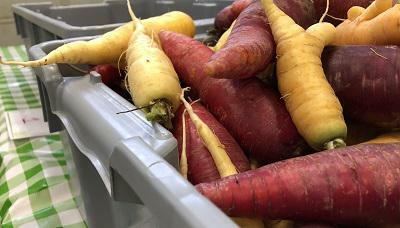 Fresh purple and yellow carrots ready for shareholders at the Southwest Farm Fresh Co-Op. This story is produced as part of Western Slope Resources Reporting, a partnership between KDNK, KSJD, and other western Colorado public radio stations. In sunny southwest Colorado, the potential for solar energy looks inviting to homeowners interested in realizing long-term savings. But that investment comes with a large cost: installation. Hiring a crew can double initial expenses and diminish the overall return for prospective solar energy users. One Durango-based group wants to improve solar accessibility by eliminating that cost. KSJD’s Daniel Rayzel reports from the roof of a Cortez home filled with 21st-century barn raisers. He filed this report at part of the Western Slope Resources Reporting project. Tourism is one of the strongest economic drivers in the state of Colorado and of many communities on the Western Slope. But the influx of visitors to some areas isn’t always seen as a good thing. For Western Slope Resources Reporting, KBUT's Laura Anderson reports on how one community is taking action. A recent report from the International Panel on Climate Change warns that countries must act immediately to mitigate the effects of global warming. As the current administration of the United States pursues policies of energy dominance, states and municipalities are challenged to adopt strategies locally towards a more sustainable future. KDNK's Raleigh Burleigh has more.